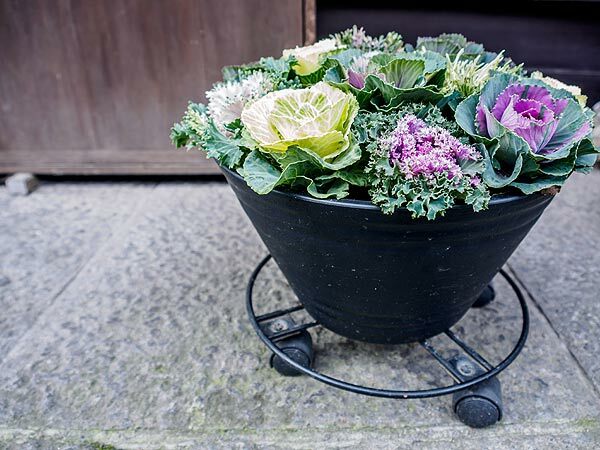 Flowers aren’t the only beautiful option for your pots and garden. Edible plants, including many vegetables, are becoming mainstays in the modern landscape. To make the most of edibles, first think about size, form, texture and color, says Rosalind Creasy, Los Altos, California. “Some people design their garden on paper. Others are good at visualizing things. I can close my eyes and see what something is going to look like.” To help visualize the end result, Creasy, who has written more than 18 books including including “Edible Landscaping” (Counterpoint, 2010), reminds beginners to always trust the tag on a new plant. “It might be a cute little six inch plant, but it will grow into a three-foot monster by summer.” Bellamy suggests aiming for a variety of leaf shapes and plant forms – consider climbing and cascading plants along with slim or tall ones. Learn about your soil type. Soil is usually made up of sand, clay and loam. If you have clay or sand or a combination, you’ll need to add organic material, Creasy says. Play with colors. Creasy suggests choosing between subdued tones or intense shades. For a romantic look, combine pastels with silver-leaved plants. For energy, use colors opposite each other on the color wheel – purple and yellow, or red and green. For a calming effect, consider shades of the same color. Bellamy likes to use colorful varieties of edibles – bright rhubarb and peppers, purple cabbages – and suggests grouping similar plants together throughout a garden.